Leaky faucets? Leaky pipes? Clogged drains? No hot water? Running toilets? Low water pressure? Universal Heating and Plumbing is Richmond area's best plumbing contractor. We have the knowledge and ability to handle all your home's plumbing needs. When plumbing is a must, call the people you trust, Universal Heating and Plumbing. We have been providing the highest quality plumbing service available and peace of mind since 1980. Being a family owned business we understand how important it is to have your plumbing work properly. Whether it is a clogged drain or no hot water our service staff will solve your plumbing problem the first time. With our 100% customer satisfaction and our trained licensed technicians you will find we are a step above the rest. We welcome any size job. 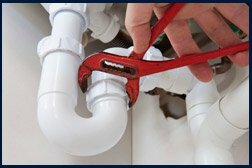 Our licensed, experienced plumbers will repair, replace, and upgrade your plumbing, as well as beautify your home with complete bath and kitchen remodeling – sinks, faucets, baths, toilets, showers, disposals and more. If you don't see what you need here please call us and ask. We take pride in our wide range of knowledge. Our technicians and trained to offer you the best available solution. All of your costs are explained and documented up front, so there are no surprises. The Universal family is known for honesty and integrity, just ask our customers.